Chief executive Tim Cook said Apple is "focusing our investments in areas where we can have a direct impact on job creation". Apple employs about 84,000 people in the US and expects to spend $55bn with domestic suppliers and manufacturers this year. The company has data centres in seven states. On Wednesday, it broke ground on an expansion of its operations in Reno, Nevada. It plans to spend more than $10bn on data centres over five years, as part of a $30bn capital spending plan for the US. The location of Apple's new campus, which will house technical support staff, will be announced later in 2018. Apple had earlier said it planned $16bn in capital expenditures in 2018, up from about $15bn in the prior year. The changes cut the corporate rate from 35% to 21%. They also stopped applying the corporate rate to profits that companies make overseas, in exchange for a one-off tax payment. House Speaker Paul Ryan, a Republican congressman who spearheaded the tax overhaul, celebrated Apple's plans to invest in a post on Twitter. "This is great news for the American economy and for America's workers," he said. Opponents to the new tax law predicted much of the money firms saved from the cuts would go to share buybacks and higher dividends. CFRA Research analyst Angelo Zino said on Wednesday he expects Apple could repurchase as much as 10% of its shares over the next 12 to 18 months. The company has spent $166bn already to repurchase shares under a plan to return $300bn to shareholders by March 2019. 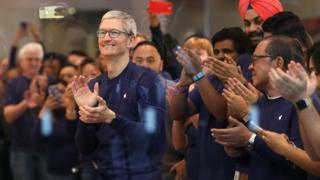 Apple has previously called for simplification of US tax rules, amid criticism of its large overseas cash holdings and investigation by US tax authorities. The company's announcement of its planned investments comes as tech firms face questions from competition regulators, as well as calls to make devices less addictive. Apple is also facing legal action over its deliberate slowing of older iPhones. The firm reported nearly $230bn in sales and more than $48bn in profit for the 12 months ended 30 September. Why is Apple struggling in China?